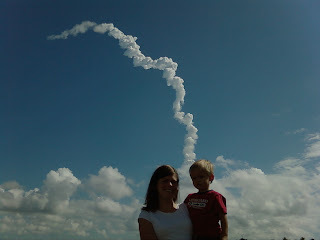 We went to see the space shuttle launch this last week. It's pretty cool to watch such an amazing feat of engineering, and such an expensive two minutes. The closest you can get is a couple of miles away on the beach, so it's really cool to see the long flame of fire following a tiny shuttle, and then like 20 seconds later, the sound reaches you. It's so loud that it was rattling the doors on the shed behind where we were watching. The next launch dates can be found at http://www.nasa.gov/missions/highlights/schedule.html if anybody wants to plan their next trip around one. Sorry the picture isn't great, I took it with my phone, which doesn't have a flash. Did I already talk about Dax's gluttony? Did I already mention where he gets it from? Well, I submit this as evidence B. Don't disturb the Dax while he is eating. Is the stick edible? Maybe it can be used to scrape up the left-overs off the cement. I wish I had more to update on this Blog than just new pics and vids of Dax. But not much else changes. Don't worry, we have our relief kid coming in Dec (the doc said he was OK inducing early so that none of us have to be at the hospital over Christmas). So those of you that are sick of Dax, just a couple more months and everything will be just fine. For those of you that don't know what an amazing job Jen does with cakes, I have included a picture of one she made for our Boyscout fundraising cake auction. Don't be fooled into thinking that she is a supporter of Boyscouts, she had too cause I'm an assistant scoutmaster. Mm, poppyseed with raspberry filling, I wanted to buy it back, too bad we're broke (actually, I don't think that word is adequate, it implies a net worth of $0, I have a net worth of like negative $100,000, ouch). We had a nice trip to Utah for a few days in the beginning of September. We stayed in Midway, and the fall colors were spectacular. We went to Wasatch Mountain State Park one day and went for a short hike, played on the swing-set, caught a fish, and (Dax's favorite) fed the ducks. It was the perfect way to spend a day, and it cost us like two bucks for worms, and another two for duck food. Ah, the simple pleasures.